Looking for a unique gift for that special person in your life? The Many Voices Walking Stick will delight that striking character for whom nothing less than the extraordinary will suffice. 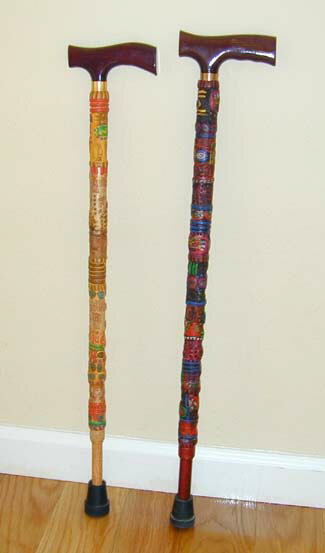 Individually sculpted by a narrative sculptor and storyteller, each walking stick is stunningly unique. 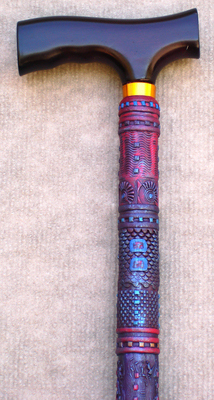 Truly a piece of functional art, these canes are sculpted with a low-fired, colored polymer that is extremely durable and is applied to an adjustable height, aluminum, wooden-handled cane. The artist sculpts images from the stories she collects from cultures around the world directly into the clay. 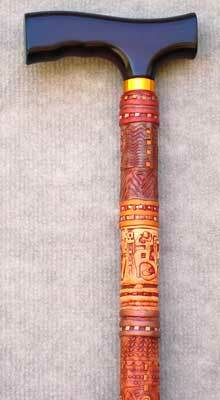 In this way, each walking stick tells different stories of cultural adventures. "It is difficult to put the stories into words to describe the Many Voices cane, but if I had to I would say this is a story of the Celebration of Life across the cultures. 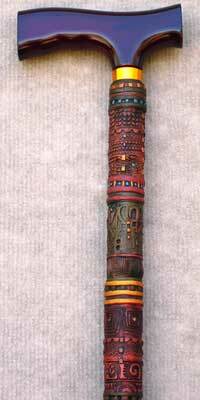 You will see people running around on the cane singing and dancing. There are many circles and spirals and other designs that represent the continuity and wholeness of living completely. It is a symbolic, abstract, and colorful presentation of some of the magic and mystery of life. 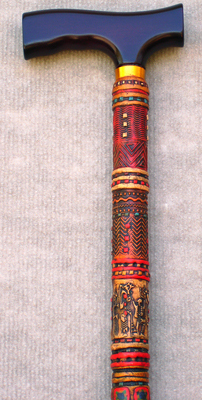 In addition its use as a functional walking stick, the Many Voices cane has also been used as a "talking stick" to pass around in men's and women's circles. Comes with a substantial tip that is designed for daily use. 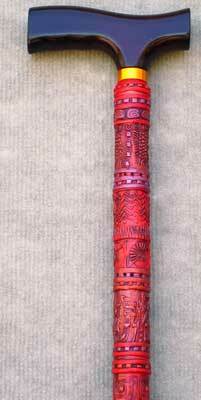 A personal note: my husband, who is disabled, relies on Teresa's cane to get around. In our home, we have stone floors and he has dropped his cane many times, but the polymer clay with which the cane is sculpted hasn't been damaged from these accidental drops. 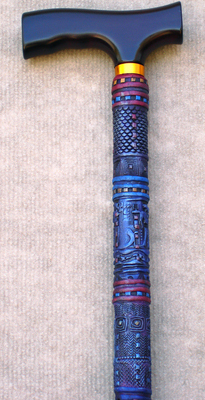 In addition to being artfully unique, the canes are durable and practical. "I can't thank you and the artist enough for the effort gone into this. It truly is a piece of usable art. The workmanship and creativity that went into this is truly remarkable. You made it all happen and have made two people here very happy. I am so happy I found your web site and have enjoyed very much talking to you, it seems we have some things in common. You make 'customer service' into something that really reflects it's true meaning."